L: 91" x W: 38" x H: 38"
Kelani Sofa Seamlessly merging classic elements with modern trends, the Kelani sofa invites you to bring home the best of then and now. 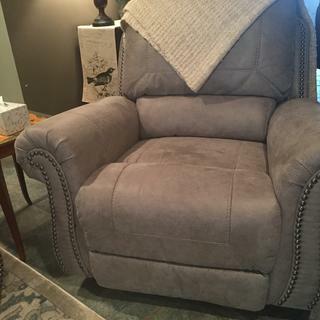 Wrapped in a fabulous steel gray upholstery with a sumptuous suede-like feel, this easy-elegant sofa is dressed to impress with updated roll arm styling and tailored touches including nailhead trim and window pane stitching. What you can’t see is every bit as impressive. Reversible seat cushions crafted with our highest quality coils to provide a bit of bounce and plenty of comfort and support. Seamlessly merging classic elements with modern trends, the Kelani sofa invites you to bring home the best of then and now. Wrapped in a fabulous steel gray upholstery with a sumptuous suede-like feel, this easy-elegant sofa is dressed to impress with updated roll arm styling and tailored touches including nailhead trim and window pane stitching. What you can’t see is every bit as impressive. Reversible seat cushions crafted with our highest quality coils to provide a bit of bounce and plenty of comfort and support. L: 91" x W: 38" x H: 38" Weight: 158 lbs. What I like the most is the comfort level it offers whether you are tired or not. I don't regret buying the Kelani Sofa...very comfy [comfortable], its worthy every cent. Service was great...timely delivery. 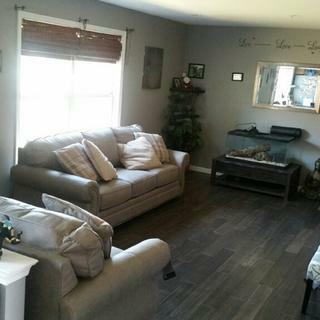 Purchased the Kelani sofa and matching recliner. Lived this collection in the showroom and loved it even more in our livingroom. A+ For Confort & Style! Love my new sofa. Curvy lines with classic nailhead trim. The fabric has a soft feel but leather look. Cushions are firm but comfy. It looks beautiful in my space. This is a great couch. Very comfortable and sleek looking. We love it! Had it for a week so far. It’s beautiful! 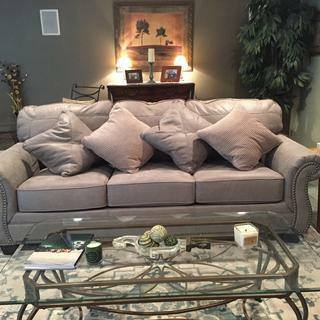 I fell in love with this couch when I saw it it is so beautiful very elegant the color gray is perfect the rivets on the couch makes it look that much more country for that Farmhouse look and you can't beat the price I paid less than $600 for this piece the quality is very good I would say excellent. The material looks like leather feels like leather but it's not. When I sit on the couch it is somewhat firm but very comfortable. I am very happy with my purchase. The salesman, Michael was very patient. He allowed me time to look around without being pushy. When I came back a second time he remembered me and again gave me time to look around and when I ready he was there. The sofa is 91 inches long. I love the soft fabric that looks like leather but is a synthetic so no worries about scratches you would have with leather. The grey is very nice and blends well with my white family room fireplace with white and grey marble. Love the sofa-hate the pillows! Really like the style and quality of the sofa. but the pillows are so dull and old-fashioned looking. We asked if we could swap the pillows from another sofa but it wasn't an option, so now looking for pillow covers than stand out and are a little more updated. Nice sofa! Solid and comfortable. Doesn't look cheap. I have only had it for a week, so I don't have a comment on durability yet. I am hoping for the best. What is the width of 1 seat cushion? BEST ANSWER: The seat cushions are 23-in wide. I understand that they have coil springs inside, surrounded with foam. Great choice and great buy.